Halong bay, so picture the scene. Strange karst mountains covered with greenery shoot up out of the water all around you. You're floating on an 80-foot junk in the middle of a spectacular bay. The air is warm and moist and perfectly pleasant, a nearly full moon shining brightly overhead. And there you are, surrounded by fifteen drunk Europeans, Vietnamese vodka and singing karaoke at the top of their lungs to such songs as “Sweet Home Alabama,” “New York, New York,” and “Country Roads Take Me Home." And you’re not alone, as there are dozens of other junks in the same bay, all full of kararoke-singing tourists and way too much alcohol. Ah, welcome to Halong Bay. It’s a three-hour bus ride east of Hanoi to the coast and Halong City, the gateway to the bay. 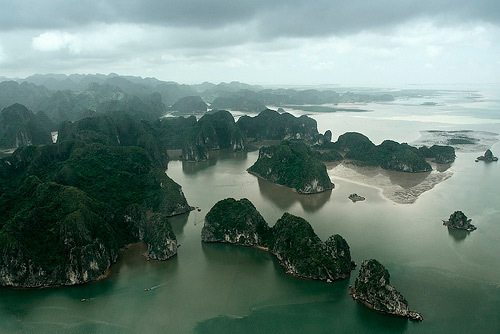 “Halong” in Vietnamese means “Descending Dragon,” as they believe that millennia ago, dragons descended from heaven and created the eerie rocks formations as they connected with our world. Romantic idea, anyway. And it would be quite the romantic spot, if not for our loveable European friends bringing back distant memories from our childhood and adolescent years with such songs as “Ice Ice Baby,” “Wonderwall,” and “Can’t Touch This.” We are, as usual, the lone Americans on-board, surrounded by Brits, Scots, Irish, Germans, Swedes, and even two Hungarians. Almost as funny as our Vietnamese guide “Lucky” and the crew watching cheesy music videos from the 80’s for hours and hours before and after dinner. The day was truly spectacular. We cruised the bay for several hours under a perfectly sunny sky - couldn’t have asked for better weather! Lunch consisted of fresh boiled prawns, seafood spring rolls, squid salad, sesame pork, and plenty of rice. Our first stop was “Surprise Cave,” pretty to walk through. After that we stopped at a floating village and proceeded to try our hand at sea kayaking - a great workout and much tougher than it looks! We kayaked through a “cave,” really just an opening in one of the rocks about ten feet above the water, but you sail right through into this gorgeous cove surrounded on all sides by narrow soaring peaks. Awesome. After kayaking we headed for a narrow beach - the crazy Europeans plunged right in, but the water was a little chilly for us pathetic Floridians. However, back on board before sunset, a few of the guys decided they wanted to jump off the top deck of the boat (about 30-35 feet down!). Not wanting to be shown up, I did my Florida-redneck roots proud and was the only girl to take the plunge (even Jeremy didn’t do it!). I was so proud of myself, though I admit it was absolutely terrifying. Dinner last night was more seafood. We've been getting a kick out of educating the Europeans on how to properly peel shrimp (as the prawns here are served whole, heads and all, and you must clean them yourselves). I guess peel-and-eat shrimp never caught on in northern Europe, because they all fumble in the most endearing way and end up ripping the things to shreds. This morning we awoke to a breakfast of eggs and toast (their bread in northern Vietnam, like much of their food, is LOADED with sugar. Our guide was explaining that they love sweet flavors in the north, while in the south it's all spice). Around 9am we docked on the largest island in the bay, Cat Ba Island, where we'll be spending the night before returning to Hanoi tomorrow. Awesome picture posted over here in this article and very nice information included in it. I like to read different articles about nature and like to enjoy it and this article has given very nice information to me.